Conventional Current vs. Electron Flow - Which is Correct? Conventional Current vs. Electron Flow: Which is Correct? Conventional Current Flow vs. Electron Flow – Which is Right? The debate rages on. Some say conventional current flow is correct. Others insist that electron current flow is right. Let’s bust this thing wide open. 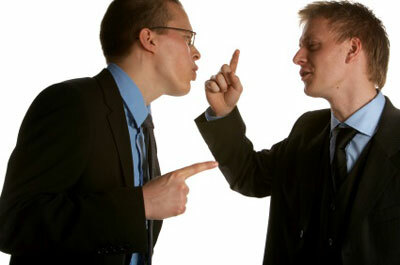 I’ll get back to the basics, take a look at both, see how each works, and squash this debate once and for all. If you’re new to electronics you may not have heard this argument (yet). If you’re a veteran, then there’s no doubt you’ve heard from both sides of the camp. We’ll start by taking a look at what current flow really is and then treat each one separately before we talk about which one is indeed correct. For most of us, this is a no-brainer. Current is the flow of electrons. Most of us tend to think that electricity (or electrons) travels very fast, perhaps the speed of light. Some would be surprised to find out that if they were able to observe the path of one electron, it’s speed would be very slow. In fact, you walk faster than an electron travels in a typical conductor. Conductors usually consist of metal. Metals have atoms containing a lot of free electrons. 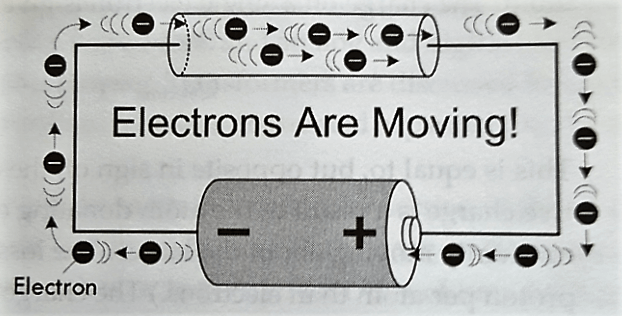 With an electromotive force (EMF) applied, the electrons “jump” from one atom to the next, creating current flow. But how can they be so darn slow when the light comes on the instant you flip the wall switch or the email you send to the other side of the world arrives in 2 seconds? The speed of any given electron is slow because it collides with other atoms in the conductor. To see why your light comes on instantly, it’s helpful to view a current carrying conductor as a tube filled end to end with ping pong balls. If you insert a new ball into one end, the speed of any given ball is slow and it only moves a bit. However, another ball immediately issues from the opposite end of the tube. The illustration below can help you visualize this. Therefore, the effective speed of electricity is the speed of light. That’s why your cousin on the other side of the Earth gets your email in a few seconds (after being routed through various switches, servers, and other gear that makes up the ‘Net). What is Conventional Current Flow? 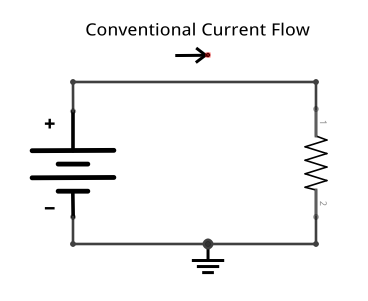 Conventional current flow is the one most often used. It states that electrons flow from positive to negative. In the image below, we can see current moving from the positive terminal of the battery through the resistance to the negative terminal of the battery. This illustrates conventional current flow. What is Electron Current Flow? Electron flow is simply the opposite of conventional current flow. Current flows from the negative side of the battery through the resistance to the positive side rather than vice versa. So, if the arrow from the picture above were at the bottom of the circuit diagram, this would illustrate electron flow. Which is Right: Conventional Current Flow or Electron Flow? In the eighteenth century when Benjamin Franklin and others were doing their experiments, very little was known about the mysterious (at the time) force called electricity that they were dealing with. Franklin had a convention of assigning positive charge signs to the “things” that were moving in a circuit doing work. It turns out that Franklin was wrong, at least about the sign of the charges that move. Later, a physicist named Joseph Thomson performed an experiment that isolated the charges. He found that they were moving in the opposite direction of conventional current, the convention that Franklin surmised earlier. Also, we know that electrons are free to move and protons are not from other experimental evidence. The truth is that electron flow is technically correct – current flows from negative to positive in conductors. There are things such as plasma and certain liquids in which positive charge can flow, but few of us will be dealing with such things at our work bench. So why do we still mostly use conventional current flow if it’s wrong? It turns out that it really doesn’t matter which convention you use if you’re consistent. Since electrons and protons have an equal but opposite charge, an electron flowing in one direction is equal to a proton flowing in the opposite direction. Therefore, we can still use conventional current flow even though it’s technically wrong and come up with the right answer. In fact, most formulas used in electronics such as Ohm’s Law pretend that current flows from positive to negative. Now we know the truth: electron flow is scientifically correct though most of us will use conventional current flow much of the time. In the end, it doesn’t really matter which one you use if you’re consistent and you keep in mind that most formulas and books (though it depends on the book) are based on conventional current flow. For most of us, the direction current flows is not important; the amount of current that flows is. Which do you prefer: electron flow or conventional current flow? Comment and share. Like this post? You’ll love the Facebook group. You’ll also love our bi-monthly newsletter & free gift (see below). TO me they’re the same thing…electrons flow one way but the holes, spaces left by electrons leaving and before another electron can replace it, flow the other way. The two theories are not mutually exclusive but complimentary. I think it is more descriptive to visuAlize moving holes than moving protons. Good point Steve. That’s another way to think about current flow. Brian, Sorry about the caps… this comment box is forcing it… not sure why. I think you miss-state the conventional current flow description above when you say ‘…electrons flow from pos to neg…’ … I think you meant ‘current’ in place of ‘electron’… everywhere else they describe conventional current flow as ‘positive charges’ or ‘holes’. That said, I was always taught electron flow in my early days of learning which included Navy schools. I am on board with steve where I look at conventional flow as ‘hole’ (absence of electrons) flow. Whenever I hear the word “holes” I think of semiconductor physics. With that said, that would also be a valid way of thinking of it, too, since at first it was thought that positive charges were moving. I’ve always been a fan of electron flow myself, but what really matters is picking one convention and sticking to it. Glad you enjoyed the post! I’ve been a long time subscriber and actually remember reading that. Louis Frenzel did a good job of explaining it and I still see his articles today in N&V, Electronic Design, and other publications.